This article is about the downloadable course for Mario Kart 8. For the stage in Super Smash Bros. Melee, see Mute City (Super Smash Bros. Melee). For the stage in Super Smash Bros. for Nintendo 3DS, see Mute City SNES. Mute City is the fourth and final course of the Egg Cup included with The Legend of Zelda × Mario Kart 8 downloadable content in Mario Kart 8 and in the base content of Mario Kart 8 Deluxe. This course is based on the F-Zero series. Coins are not present naturally on this course, and can only be obtained by driving over the recharge pathways, Item Boxes, or picking up the coins dropped by other players. A view of the cityscape surroundings. The track takes place entirely in anti-gravity. 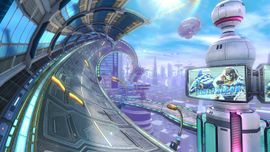 Signs and buildings throughout the course depict and reference the various F-Zero racers, including Captain Falcon, Samurai Goroh, Dr. Stewart, Pico, Jody Summer, and Mr. EAD. Right off the start, several boost pads and recharge paths (which gives them a maximum of ten coins) can be found. After a U-turn, the track begins to corkscrew before a large jump. Afterward, the track continues on a cylindrical route that continues to twist before another jump leads into an opening in a building. Here, two more recharge paths can be found before the race continues outside. After a few turns, the track becomes a down hill drive past a Rocket and a few signs depicting Captain Falcon before it arrives at the finish line. There is a mud section inside the U-turn after the exit of the building, that one can cut off if a mushroom boost or star is used. The turn before the downhill section can be cut off by boosting through a muddy path leading to a ramp, which then leads to another platform that one can use to get to the main path. One can use a star or mushroom to boost through two mud patches before going off the final jump to the finish line. The staff ghost for this track is Mario in the Blue Falcon, with Metal Mario in Mario Kart 8 Deluxe's 200cc Time Trial. Mario, in the Blue Falcon, turning the first corner. Mario, taking the shortcut on the downhill section. Peach turning a corner in the Blue Falcon. Rosalina and Bowser, racing at Mute City. Rosalina performs a trick while approaching the finish line. Baby Mario, drifting on the first turn. Toad, racing on the course. The stamp for this course. Instead of using the normal starting line countdown and results theme, this course uses the equivalents from the original F-Zero; this is the first track in the Mario Kart series to do this along with Big Blue. The starting line countdown theme only happens during Grand Prix and VS. races, however. Some of the signs across the track show Captain Falcon's art from F-Zero X alongside the text "SHOW ME YOUR MOVES! ", a reference to his taunt in the Super Smash Bros. series. A desert can be seen on the outskirts of the city, possibly a reference to the Sand Ocean course from the F-Zero series. The Boost Pads on this course looks identical to those that appear in Super Mario Kart and Mario Kart: Super Circuit, the only difference that they are animated, instead of flashing. In the second and third lap, a Boost Pad will activate in the finish line. This is a reference to the Boost Power from the F-Zero series, which is activated after completing a lap. This page was last edited on February 19, 2019, at 19:20.